Pelenna Patchworks: Mermaids and sea creatures frolic in the fresh new Under the Sea patchwork fabric range! 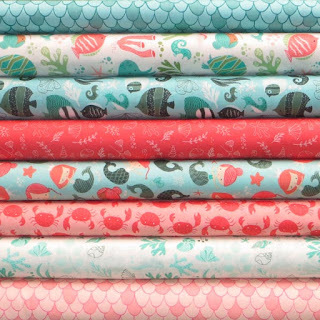 Mermaids and sea creatures frolic in the fresh new Under the Sea patchwork fabric range! Designed by Heather Rosas for Camelot fabrics, Under the Sea is a lovely, fresh range of fabrics featuring mermaids and their under the sea kingdom! With sea creatures, shells, fish scales and more all in aquatic turquoise, coral and cream colours, this is a great range for a bright, modern child's bedroom.